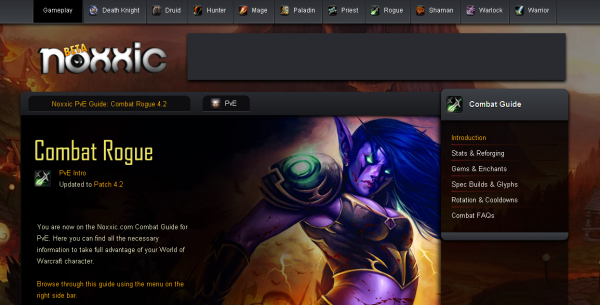 What Noxxic provides are class guides, current to Cataclysm, and a very elegant format. Traditionally one would need to go to sites like Elitist Jerks and then drill down through the forums to find information like this, or at the very least, find a central source for all of the classes. I have heard a few folks in the community of late mention that there are whispers of EJ losing some of its credibility. Perhaps this is simply in terms of being up-to-date, or perhaps their hard-edge nature and public humiliation component in terms of bannings has finally caught up to them. That is not a statement I am making, simply expounding on a possibility. Well what is someone to do if they want a central source for all things class guides and either do not enjoy the EJ environment or simply do not trust the information? Noxxic is a wonderful alternative that I highly recommend trying. I myself have found a use for it already. I have played, on my Rogue, the Assassination spec since very early ICC content and just recently picked up a Mace and started rolling as Combat. Obviously, I knew nothing about modern Combat spec mechanics, so I went to Noxxic and had a great time reading up on the new rotations and such. That’s one of the greatest benefits of Noxxic, it’s just so pretty to look at. Head over there and see it for yourself! Used this a number of times. Very clean!